At La Paz Regional, we believe understanding your health care options and what your health care will cost is important. 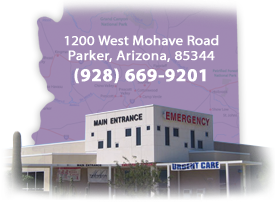 This site has been created as a resource for potential decisions you may make regarding health care services provided by La Paz Regional Hospital. The price information on this site primarily applies to patients who do not have insurance. As more people become insured we anticipate that this price information will not be as relevant. The majority of uninsured patients that will use this pricing information will relate to the self-pay discounted prices that are part of La Paz's financial assistance program. (See Uninsured/Under Insured) This program is designed to provide uninsured patients rates similar to those who have insurance. If you have questions, you can contact Financial Services at (928) 669-731. Thank you. "Cash price for Mammograms during October Breast Cancer Month are significantly less."